In a real world, side-by-side comparison, the DS161 remains one of the brightest strobes on the market. More importantly, the quality of light is exceptional due to a round flashtube and reflector designed specifically to delivery the softest, most even coverage possible. The DS161 remains the favorite of pros worldwide for delivering a warm light without needing to add a light-dimming diffuser. The most convenient and cost effective way to add video lighting to your camera rig. The diffused 500 lumen beam is perfect for close-up video and focusing. Adjustable brightness in 10 settings plus SOS mode for emergency situations. Automatic shut-off when the flash fires ensures that it will have no undesired effects on still photos. State of the art Li-Ion battery technology produces over 450 full power flashes at an unprecedented 1.4 second recycle time. Our proprietary quick-release toggle system attaches the battery pack with ease and confidence, making a flooded battery virtually impossible. The included Smart Charger product no. 4067.1 accepts variable voltage in the 100-240V range and includes AC adapters for US, Europe, UK and Australia. This charger is compatible with lithium ion battery packs only. The rechargeable battery pack is interchangeable for quick turnaround in between dives. Existing 4066.5 NiMH and 4066 NiCad batteries are forward-compatible with new strobes. Older 4066.1 Smart Chargers may not be used with the current 4067 Li-Ion Battery Pack. 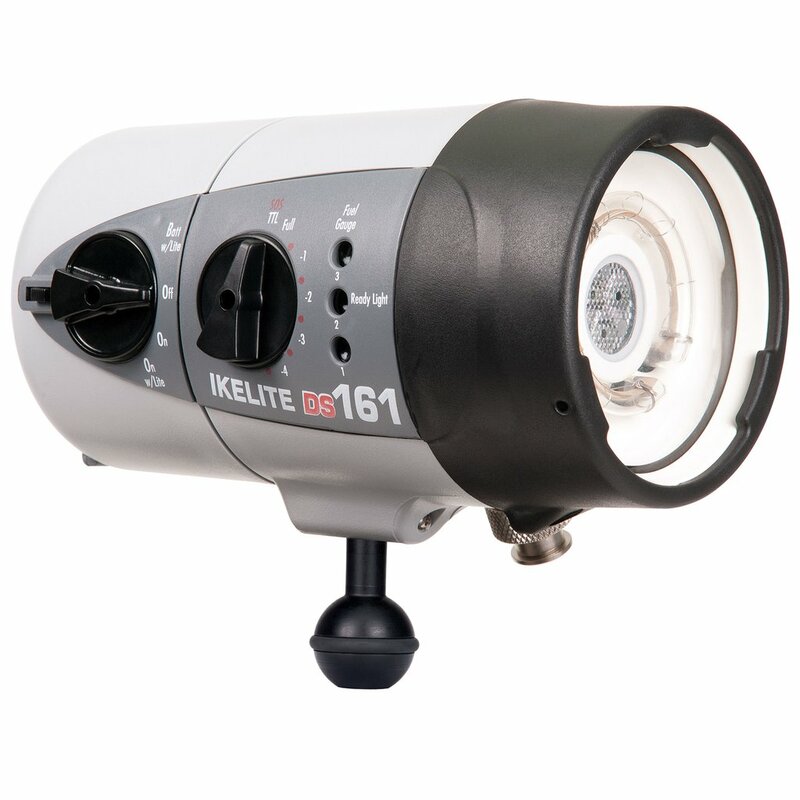 When combined with a compatible Ikelite TTL system or film TTL system, the DS161 automatically adjusts brightness to provide perfect exposure whether you're shooting macro, portrait or wide angle. The DS161 is approximately neutral in salt water for the most ergonomic and comfortable handling of your camera system. Other strobes require expensive buoyancy arms to provide this key feature!